This 16th century icon from the Great Meteoron Monastery in Greece was completed in 1552. Christ is led bound, surrounded by soldiers who see Him with darkened earthly eyes, not enlightened spiritual ones. 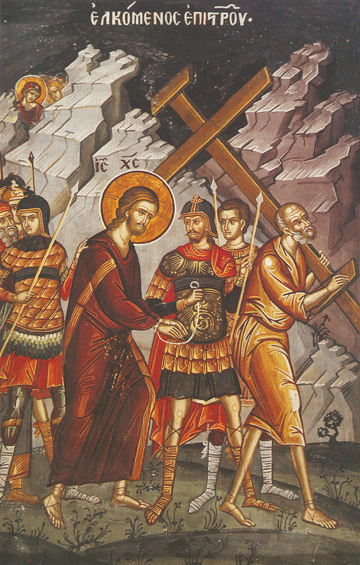 Simon of Cyrene is carrying the Cross before them when Christ in His humanity was too weak to carry it Himself. It is incomprehensible to proud hearts and minds how the Lord of Life and all of the Angelic Hosts appears weak in His meekness and humility out of love for us and His Creation. Only by entering such a path of meekness and humility can this make any sense to us, and He invites us to see and understand. Above on the hills the Virgin Mary can be seen looking down at these things happening. Although she feels real pain at the suffering and humiliation of her Divine Son, as St. Simeon the God-Receiver had said, “A sword shall pierce your heart,” yet she also pondered these things in her heart. Nothing here in this world is merely worldly or by happenstance, but all has spiritual meaning that can only be understood with the blessing of an enlightened and repentant mind. O Lord, Who suffered for us, give us this mind!